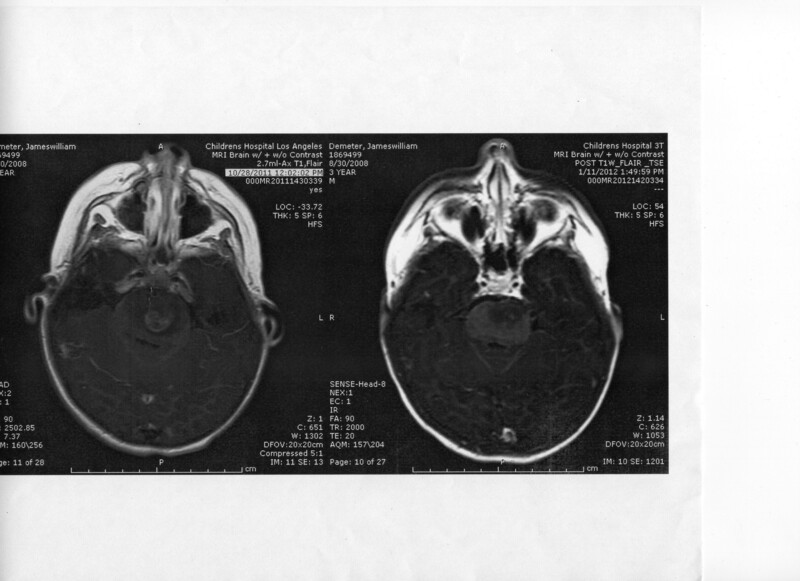 A Diffuse Intrinsic Pontine Glioma (DIPG) is a tumor located in the pons (middle) of the brain stem. The brain stem is the bottom most portion of the brain, connecting the cerebrum with the spinal cord. The majority of brain stem tumors that occur in the pons (middle brain stem) are diffusely infiltrating (they grow amidst the nerves), and therefore are not able to be surgically removed. Glioma is a general name for any tumor that arises from the supportive tissue called glia, which help keep the neurons (“thinking cells”) in place and functioning well. The brain stem contains all of the “wires” converging from the brain to the spinal cord as well as important structures involved in eye movements, face and throat muscle control and sensation, like the Grand Central Station of the nervous system. The majority of children diagnosed with DIPG are aged 5-10 years of age, and the definitive diagnostic procedure is MRI of brain and spinal cord. It is highly aggressive and difficult to treat; the median survival time with treatment is 9 months. DIPG is the 2nd most common pediatric brain cancer. Approximately 200-400 children are diagnosed with DIPG each year. While DIPG is usually diagnosed between the ages of 5 and 9, it can occur at any age in childhood. These tumors occur in boys and girls equally and do not generally appear in adults. Brain tumors are the leading cause of death from childhood cancer. For those diagnosed with Diffuse Intrinsic Pontine Glioma, the prognosis is unfortunate. Radiation therapy is usually successful in providing some short-term relief, but then the tumor invariably reorganizes and no current chemotherapy has proven to change the terminal prognosis, nor has repeating irradiation. DIPG tumors are limited to the pons area of the brainstem, it is diffuse in nature, intertwined with healthy tissue, and is inoperable. There has been no significant clinical progress for DIPG patients in over 30 years. We personally have found no long-term survivors; research is urgently needed. The need for DIPG research is extremely urgent; cancer leads the list of causes for pediatric mortalities, second only to accidents and injury, and DIPG is one of the leading causes of death in children with cancer. Brain tumors, the leading cause of death in children with cancer, is one of the least-funded areas of cancer research. Only 4% of our federal budget for cancer research benefits pediatric cancer as a whole. Please support HRes586, which asks that mortality rate and potential years of life lost are factors in the decision-making process regarding our tax-dollars for cancer research. Thank you for your attention to those afflicted by this uncompromising disease. Funding DIPG research is our priority; Children’s Hospital Los Angeles is our research beneficiary for our “Count to a Million” campaign through 2015, (www.jacksangels.org), having initiated a fund for DIPG research in Jack’s honor. We are committed to the idea that DIPG research invariably benefits all of neuro-oncology and represents an important contribution to advances in medicine. Equally we are committed to affecting change in the experience of a family receiving a DIPG diagnosis for their beloved child, that there be hope for survival. 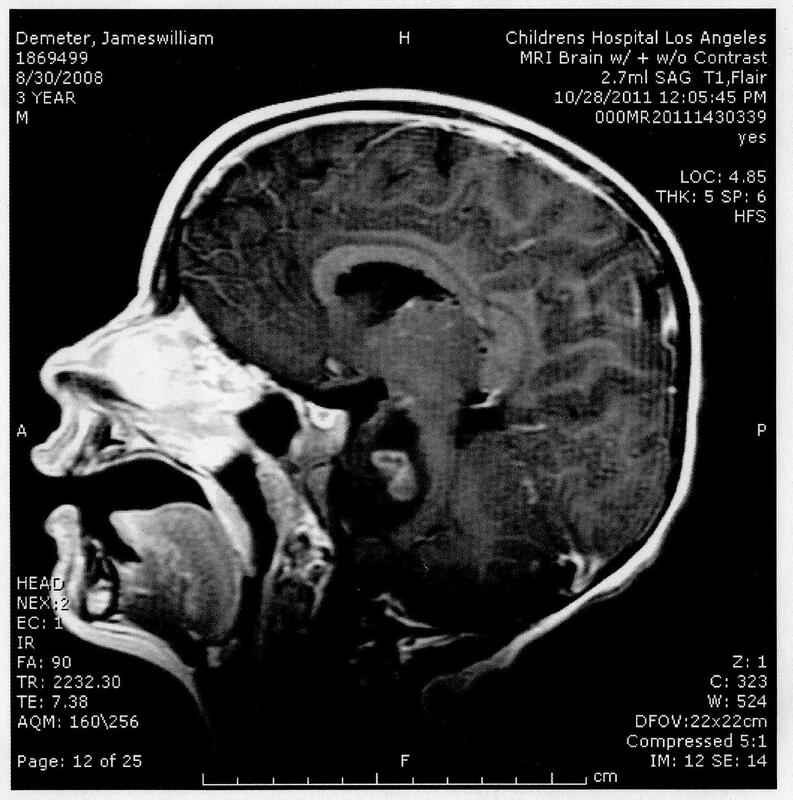 Treatment of newly diagnosed diffuse brain stem gliomas in children – David N. Korones.